Thanks to two scanning modes, this model offers the easiest and fastest way to share your slides with the world via social networks like Facebook or Flickr. Scanning time is quite long. 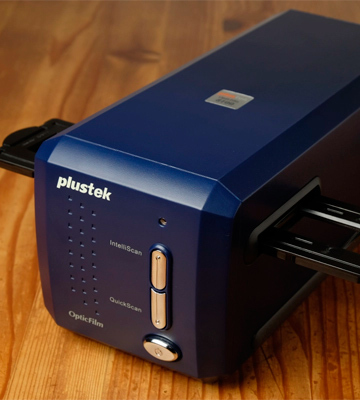 This multifunctional scanner will offer you to turn your photo slides into digital images in JPG, TIFF, PCX, and BMP file formats with the best possible quality. There is a high-contrast display that offers the colour rendering close to that of the natural so you will see the scanned images exactly as they would look on the monitor display. The Photo / Film modes switch is under the lid, which is not very convenient. The model allows you to scan not only slides and film but photos of up to 12.7x17.8 cm in size as well, and at 22 MP resolution to boot. The images you scan will be exceptionally detailed. 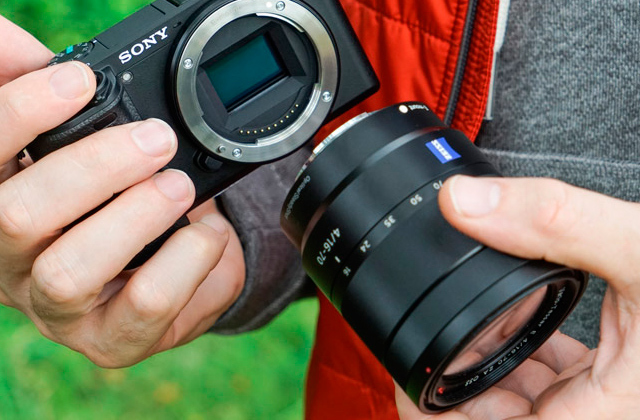 The integrated auto-exposure and auto-colour balance features will help you obtain images of the highest quality. The tiniest details on the photos might be lost sometimes. 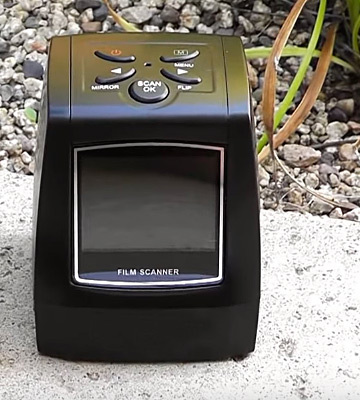 Easy to master and use, this scanner for digitizing slides and film can work with or without PC connection and provides quality images of up to 2MB. In the set, you will find a rapid slide feeder for 25 slides, which, combined with the easy push-pull operation, makes scanning a lot of slides in one go much easier. Some users find the native software lacking in colour rendering quality. A great choice for anyone with an extensive library of 135/126/110 mm films or 35 mm mounted slides since this slide scanner enables fast digitizing. Besides, setting up the device requires little to no time and effort. You can easily hold this scanner with one hand, it is that small and lightweight. No need to look for a place to store it, it takes virtually no space at all. The slide holders need careful handling, they are somewhat flimsy. A miniature scanner to easily make digital copies of your slides, it does not require any special skills, software, or any specific PC characteristics. Does its job fast and with quality results. Probably, the first thing you will notice about this slide scanner is that there is no display on it and, therefore, no computer-free operation. We'd like to assure you that this, and maybe a rather low scanning speed compared to some other models (from 36 to 113 seconds with a preview in 8 seconds, as stated by the manufacturer), will be the only drawbacks to be encountered working with this machine. The quality of the images digitized with this model is incomparably good. The maximum resolution stated is 7200 dpi. Most consumer-level slide scanners offer something around 2500 dpi. 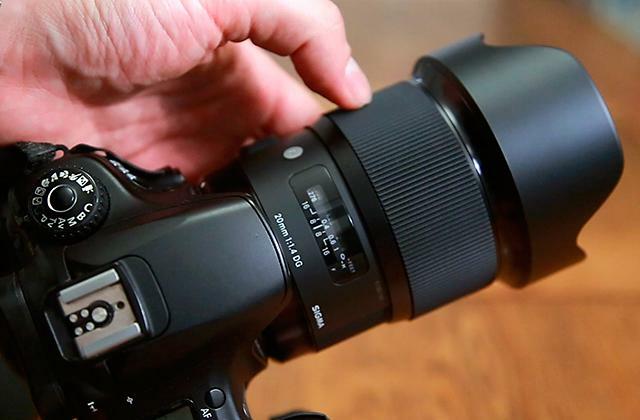 Even the tiniest of details on your photos will become discernible. You can also choose the colour depth between 24-bit and 48-bit for, well, colour photos and 8-bit or 16-bit for grayscale ones. Of course, there is a 1-bit black-and-white scanning as well. The model works with Windows computers with as old a system as the XP and up to the newest Windows 10 and all in between. Mac OS computers starting from OS X 10.5.x and every edition after that, including the latest High Sierra Mac OS X 10.13. All covered nice and well, making this slide scanner a universal model. But that's not the end. 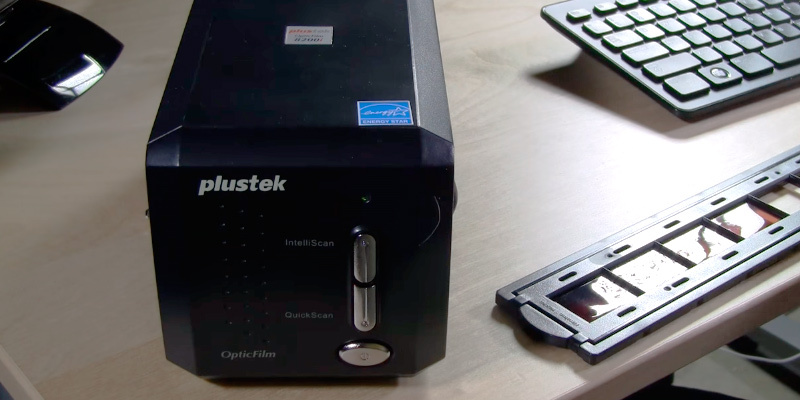 The Plustek OptiFilm 8100 has two main modes it works in: the QuickScan and the IntelliScan. The names say for themselves in a nutshell but let us explain some peculiarities. The QuickScan will digitize your film and negatives faster, obviously, but you will have limited control over the settings. That is, you will be able to adjust the basics, like the scanning mode, input resolution, brightness/contrast/gamma, destination folder, etc. There are even several filters but not too many. All the settings you fix will be remembered by the device's software and unless you call up the Settings window again all your QuickScan sides will be scanned in accordance with them. Perfect for fast scanning. On the other hand, there is the IntelliScan mode, as in Intelligent. This one opens the special software, the SilverFast SE Plus 8, included with the purchase. This software offers a whole lot more options to tweak, from resolution and film type to selective colour correction, curves, noise elimination, multi-exposure, and many more. The features targeted at negatives are especially remarkable, for example, the NegaFix feature will not only invert your negative into a positive but will also find and fix the issue of a so-called orange mask many negatives have. There is also an upgrade possibility to the SilverFast Ai Studio software with even more options if you're in need of something even more extra. The DIGITNOW! M129 is not just a slide scanner. It is, basically, a multifunctional scanning unit. 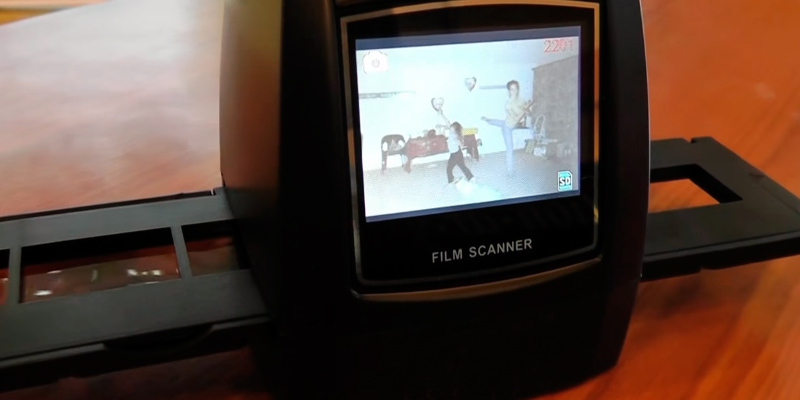 That's right, besides scanning slides and negatives, this model can also scan actual photos if you happen to need it. 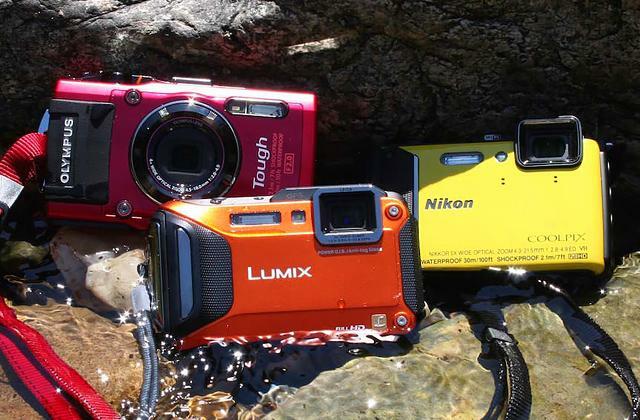 The photos of the size up to 12.7x17.8 cm in size. Granted, this is one of the smallest photo sizes, alternatively called the 5R, but still. As for the slide scanning, which is our actual topic here, the selection here is pretty standard: you get to scan 35 mm slides and 135/110/126 negatives. So what makes this model so special that it made into our list? Well, besides scanning printed photos that would be the scanning resolution, which is 22 megapixels. That's one of the largest resolutions among this class of devices and, though it does not come cheap, it is more than worth the cost if you are aiming to digitize your slide/negative hoard at the best quality possible. Scanning a single item, be it a photo, a negative, or a slide, takes approximately 3 to 4 seconds, fairly decent speed for the class that won't make you wait around frustratingly long. There is a standard-sized LCD display on the front panel of the slide scanner so that you could see the preview when you scan. It is not really an exceptionally unusual feature as of today but its convenience is hard to overestimate. The said display is of pretty good quality, with high contrast and vivid colours that look nearly identical to those on a well-calibrated monitor, so you will be able to see the preview as close in precision to the resulting image as possible. The control panel is pretty convenient at the front, right beside the display. The mode switch to alternate between slide and photo scanning is located near the photo scanning are itself, that is, at the top panel covered by the lid. This is considered a somewhat weird and sometimes inconvenient placement by a number of users but we have found it quite okay: unless you alternate between modes constantly each scanning session, this shouldn't really be a problem. 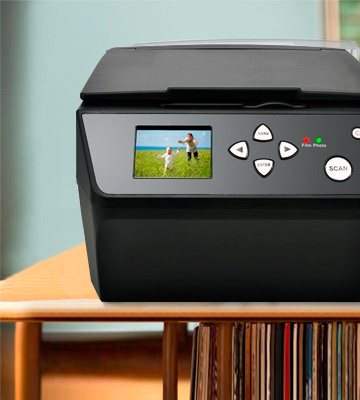 Besides the slide scanner itself, the delivery package includes a disk with photo editing software with basic necessary functionality and an 8GB SD card where you can store up to 2000 of your digitized photos. 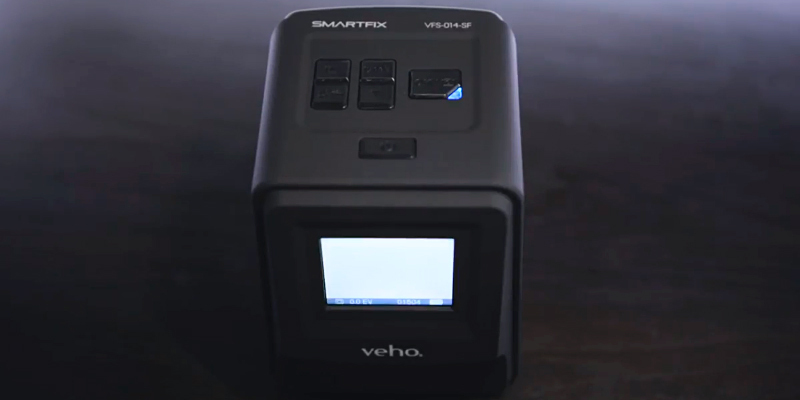 The Veho Smartfix is one of the lightest slide scanners on the market if not the lightest one, its listed weight is mere 363 grammes. And with the dimensions of 10.9 x 14 x 9.9 cm, you might actually forget you have it in your handbag. Carrying it around is the simplest thing possible, you can gather all the slides and negatives from your friend and family to scan them right there and then, without having to carry them home where there are chances of getting them mixed, for example, or worse—damaged and lost. It is quite pleasant to the touch as well, the housing has a Tacton rubber touch finish. 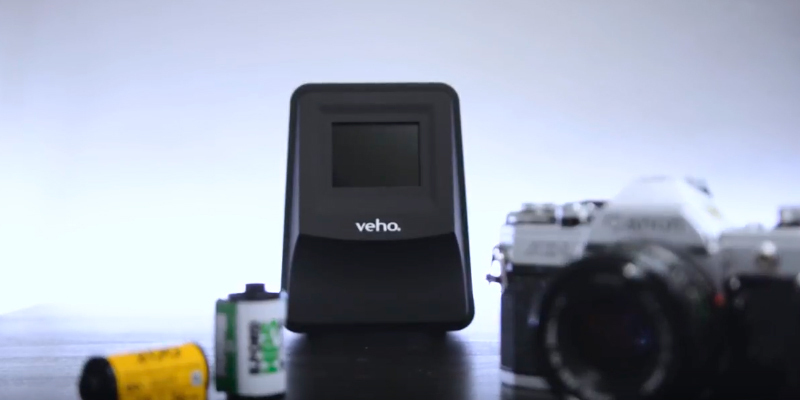 This Veho slide scanner and negative reader will convert 135 slides and 135/110/126 negatives into the digital form for safekeeping of memories and for further enhancement and creativity. It has a quality Lithium-ion battery that can be recharged via either a USB cord or from the mains (with the help of the 3-pin plug with a USB port). The same USB cord can be used to transfer the scanned photos to your laptop or PC if it lacks the SDHC / SD card slot. The card itself is not included with the purchase and the supported card storage space is stated to be up to 32 GB. 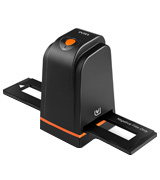 The scanning speed is fast, it will take approximately 3 seconds for a single slide to be scanned, though some users suggest you wait for the autofocus to settle before you push the scanning button. It is also possible in some cases for the smallest details to be lost during scanning but when we say "smallest" we do mean it: you might only notice it if you compare these scans to the ones made with a scanner that offers much bigger DPI and, consequently, costs quite a bit more. 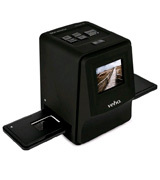 For the price this model is sold at, we find it one of the best slide scanners out there. 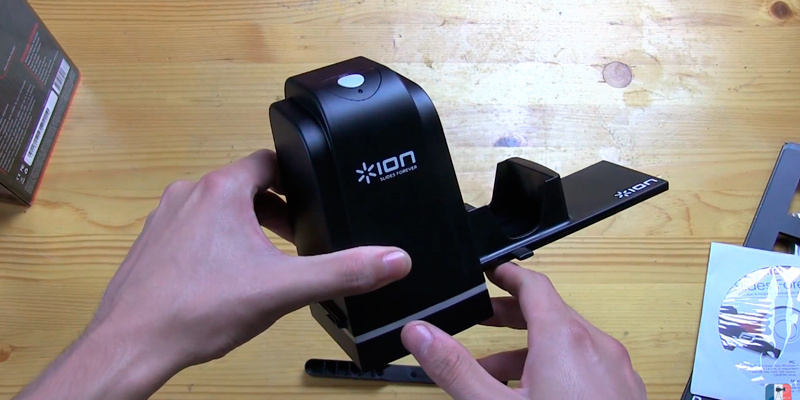 This slide scanner from ION Audio is quite cheap and is designed with ergonomics in mind. 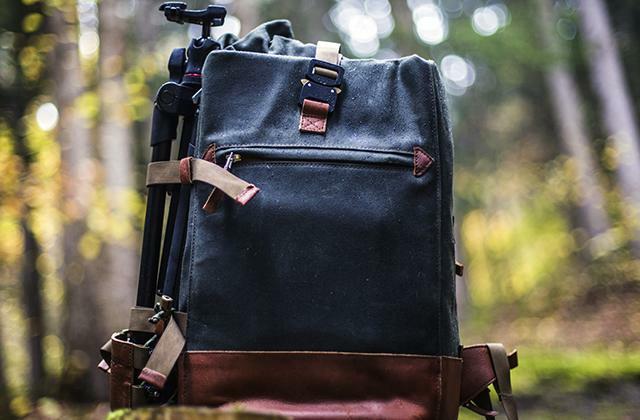 It is compact and won't take too much space of the desk, or you can carry it wherever you need in a bag. It is easy to use with the one-touch operation feature—you just push the button at the top and the device will do the job for you. 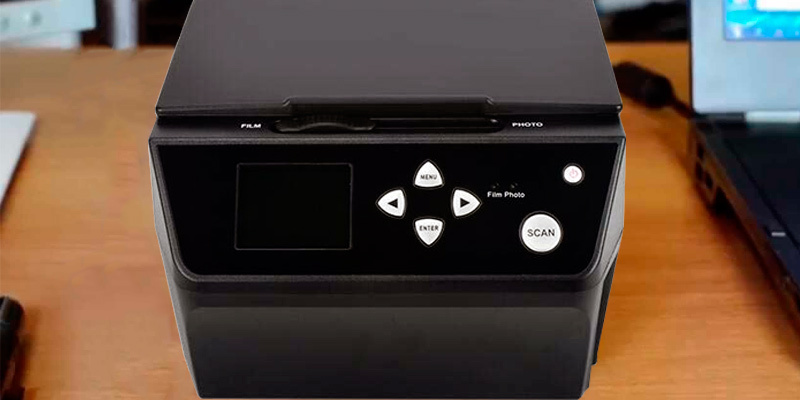 It is also really fast when it comes to actual scanning—for a single slide or negative, it will take 1 to 2 seconds, making this model one of the fastest in its price range and class on the market today. There is no display on the body so you will need to connect the scanner to your PC or laptop. 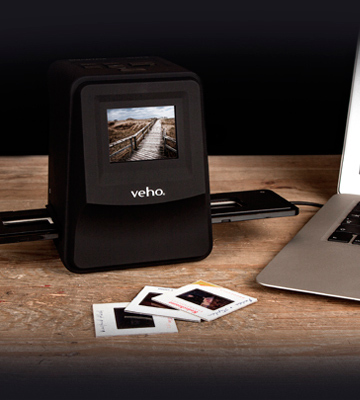 The cord is supplied with the purchase, as is the software to easily digitize and transfer your slides and negatives. The scanning sensor is 5 megapixels, which is quite far from the biggest numbers on the market but is still considered more than suitable to obtain quality high-resolution images from negatives and slides. The compatible sizes are 35 mm for slides and 135/110/126 for negatives, basically, a standard set. 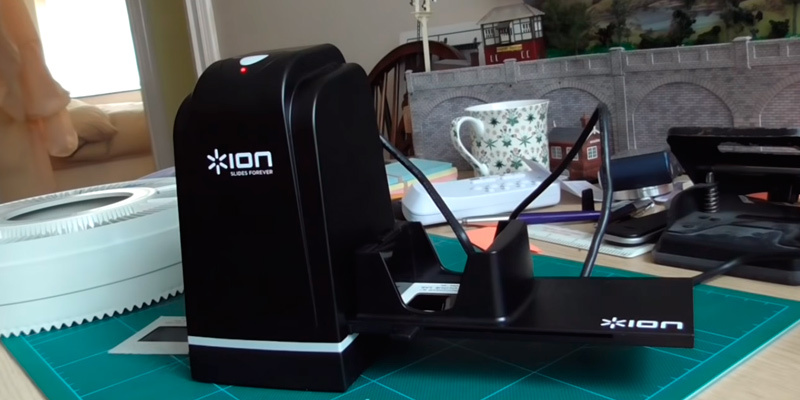 Having purchased this slide scanner, you get, in addition to the device itself and the connecting USB cord, a slide holder, a negative roll feeder, and a rapid slide feeder. 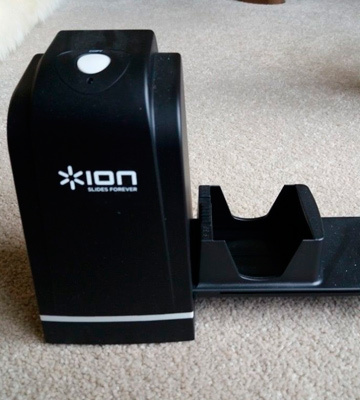 The last three are aimed at making your scanning job easier: the holder will keep the slides all neat and reasonably even while the feeders will allow for faster and more ergonomic scanning. These are the features that will be most valued by the people who have large libraries of negatives and slides to go through or a continuous addition to the queue to digitizing since it makes the job way easier and faster. The operation is as simple as they come, the only things you need to do is install the included software to your PC and connect the slide scanner to the computer with the supplied cord and you can start right away. The software compatible with both Windows and Mac operating systems. There are two modifications to the scanner available. The first one is as described and the second one quite a bit more expensive but offering ultra-high-resolution scanning and a display on the body, among other things. And it still costs way less than some of the competitor models with similar specs. This model is the best scanner for negatives and slides among the cheap and portable ones. It might have neither over-the-top resolution nor the ability to scan anything other than 35mm negatives/slides/transparency film but at a reasonable price, it offers a scanner the size of an average human palm (L87xW86xH102 mm) with specs better than most in its segment. The DIGITNOW! 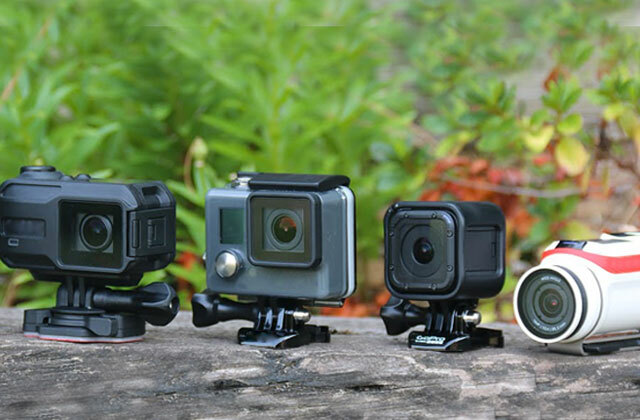 can be easily carried around wherever you need it and it will scan and store on a memory card all the slides and film; it will also do it quickly and diligently at a generally acceptable 5MP optical resolution (10MP if you use interpolated scan). This model will scan your film and slides and create images in JPEG format at the size of 1824 x 2736 pixels when scanned with optical resolution and at 2588 x 3888 pixels if you go for interpolated. There is no need for special software and even for PC connection to perform basic editing—on the top panel, you will see the buttons to flip the image, rotate it +/- 90°, mirror it, as well as use automatic colour balance and exposure. Nothing too fancy, but it is a solid base for a gadget like this. 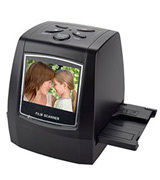 The built-in 2.4” TFT LCD display will allow you to preview the images but you can also connect the scanner to either your PC via the USB cord or to a TV—the 3.5 mm TV out interface supports both PAL and NTSC. The word “interpolated” is often seen in scanners specs and the numbers under this spec are always greater than those of the optical scanner but they always go second. So what is this interpolated scanning? Without going deep into tech-savvy details, the interpolated scanning does relatively the same as enlarging your image in a simple photo editing program would do. That is, it stretches the picture and fills the appearing gaps between pixels with new pixels, coloured some shade in-between the two shades of the pixels that were previously beside each other. Even simpler, it’s like some sort of gradient colouring—the new space is filled with colours similar to all the nearest pixels at the same time so that no one sees a “glitch” where the empty new part was. This method does the enlarging trick well if you need to stretch the image a bit, however, when it comes to large resolutions, like doubling the size, for example, the picture will most often end up blurry and smeared. That’s why scanners, including film and slide scanners, although do have this option but do not use it as a default—it makes pictures of not the highest quality, at least when we talk about colourful and grayscale photos. When you have a line art or a text to scan, interpolated scanning will certainly come in handy. In the digital age, we can easily snap a picture with our phone and upload it to any web source. But what about the old slides and printed photographs stored away in the attic, collecting dust? Is there a way to bring life in those pictures and share them with other people online? Well, there actually is, and it is a slide scanner, an electronic appliance used to convert all real photos to the digital format to keep on a computer or an SD card. The operation principle is pretty simple. You place a picture in the slot, wait a second until it takes its photo and then it is converted to a digital file. The digitized copies can be stored either on a flash card or written directly on the hard drive. Easy as that. As a side note, the inkjet printers can provide you with quick copies from the scanned negatives. You can also buy a portable pico projector for showing off your digital photos collection to your friends and relatives. Resolution. Simply put, this refers to how huge your digital copy of the film or the photo will appear on the computer screen. As a rule, the bigger it is, the more details will be seen on it. If you are going to further process the image in the graphics editor, you will require at the very least 1800 dpi resolution for 35mm film slides. However, even 5 MP will be enough if you just need to quickly scan a bunch of slides to store them further on your PC. 200-400 dpi will be enough for most programs to effectively recognize the printed text from the scanned slides. 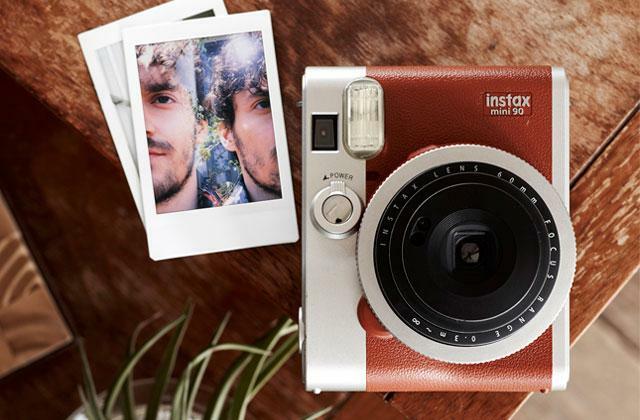 Taking into account the Intended Use, you will be able to figure out what types of film formats and/or photo sizes exactly the scanner can process for you. 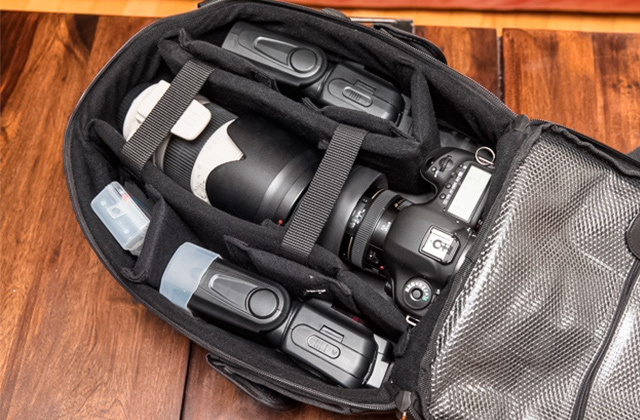 Usually, the slide converters have either special slide adaptors or an adjustable tray for this. You need to make sure the chosen slide scanner is compatible with the films you've got at your disposal. Scanning Speed is a pretty straightforward characteristic, too. 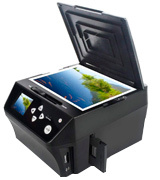 If you are searching for a slide scanner to use in a little print shop, a quick scanning speed will considerably reduce a wait time for consumers in the line. Additional Features may include a variety of things. 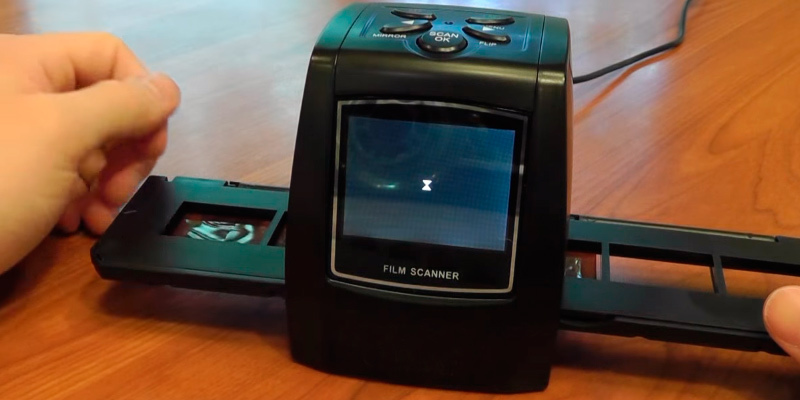 For instance, some of the scanners come with a small screen for checking a slide position inside the scanner. Others might come together with a cable so that they could be connected to other appliances (TV screens, PC monitors, etc.). 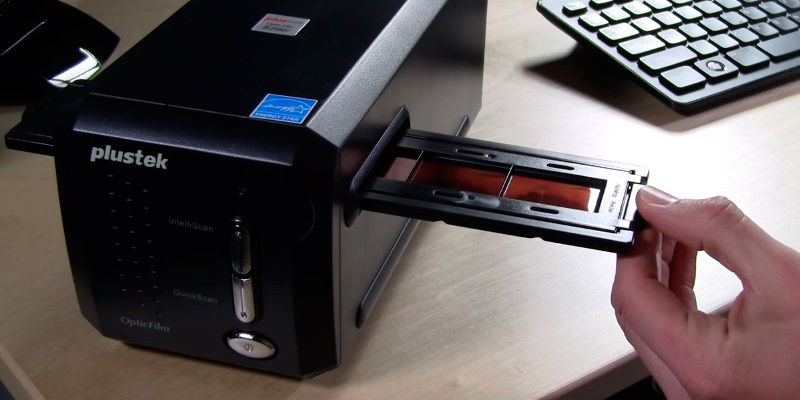 A lot of slide scanners offer versatility of use and can work not only with the film but also with photos, just like conventional PC scanners do. When you read the “in the box” part of your future digital slide scanner, you’ll most likely see that there are different trays for mounted slides and for negatives. Some of us presume, at first, that they only differ because slides are of different size due to the casing. In reality, it is not true: whereas negative film does offer you an image with its colours inverted, the film inside a slide is actually a positive, that is, with the colours the way they will be when you scan the slide. 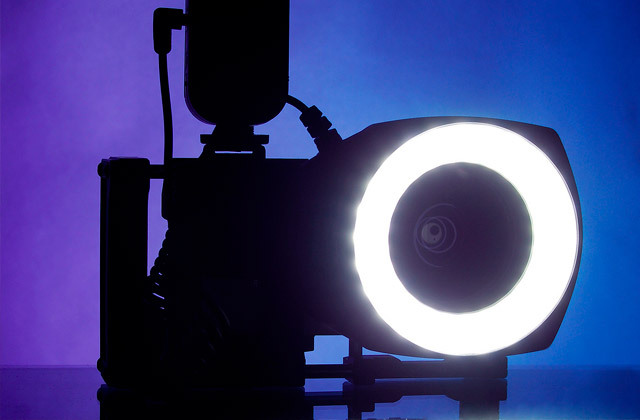 A film, both positive and negative, contains more information about the image than any printed photo can. At least, with the level of printing technology we have today, let alone the technology we used to have before the digital age. Scanning a film, especially with a dedicated slide scanner, will result in an image of richer and deeper colours, with more contrast and luminance and, as a consequence, with more details. Film also allows for better resolution for scanning, which, in its turn, offers bigger images without any quality losses. One might think that storing a film suspended in the air in a closed dark room where neither kids nor pets ever come is safe. Unfortunately, this is not true. A film is a very fragile material, and it can be damaged not only by accidental nail or paper touch but by a thing as unavoidable as air movement. Yes, it is true, no, we’re not joking here. The problem is, there is no such thing as clean air, not really. Invisible to the naked eye, there is always some dust or tiny debris moved by even the slightest blow of wind. As tender as the film is, it won’t take much time for a scratch or two to appear. And you most probably won’t even see it on the film. Where you will see it is on the scans and prints done years later. That’s why it is recommended to use a scanner for slides and negatives as early as possible to preserve the memories. After that, you can give the film to a professional for cleaning and then store it in an air-tight container. 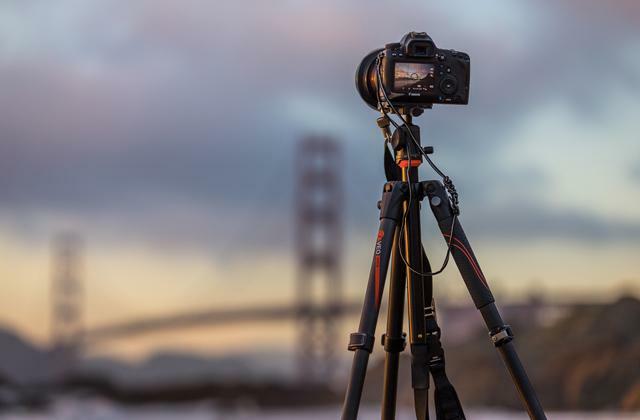 Lately, it has been a trend in not only photography but in other industries as well. Torn and damaged jeans, muddy prints on t-shirts, even old-looking music videos (have you seen Coldplay’s Up&Up?). This trend hasn’t passed photo industry by: the photos are bleached, burnt, distressed, and scratched on purpose, then put into film and slide scanner. Glen Luchford, a talented photographer, even has published a book called Damaged Negatives in 2012, though hers weren’t destroyed intentionally but rather had fallen victims to an unfortunate accident. So why is this so popular? People just love broken things, don't they? You can compare your scanned film with the photos printed in the special stores—to fit into a specific mould the size of the photo you have ordered, the image on the negative is usually cropped at the sides a bit. Sometimes, this "bit" can reach up to 10–15% of the picture and be different on each side. It does not always matter much since we always try to leave space around people on the photos so they don't look crowded but there are cases when the details at the edges might be important, and scanning a slide always leaves it up to you to decide what you want to crop. Q: What format is the best for scanning slides? A: The format home slide scanners use most often is probably JPEG since it offers output images that do not take much storage space, so you can save more photos on your memory card or gadget. 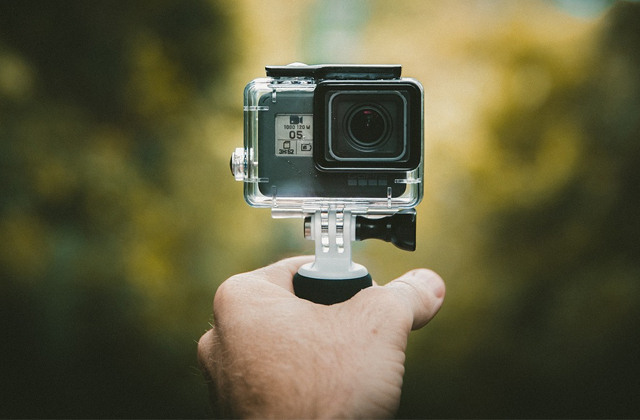 However, it is not the best option if you plan to edit photos further—JPEG is quite lossy when it comes to quality. Some models make images in BMP, PNG, or TIFF. The latter takes up the most space since it saves all the image data during the scanning; it is the format generally used for professional and commercial scanning. PNG format is good if you plan to create collages from certain objects on your photo scans—it allows for transparent background without noise at the edges as GIF does, for example, and it does not take as much space as TIFF. 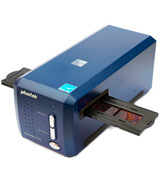 If you need scans for a variety of purposes, some manufacturers have multi-format film scanners to offer. Q: What resolution do I need? A: This depends on what you plan to do with your photos. 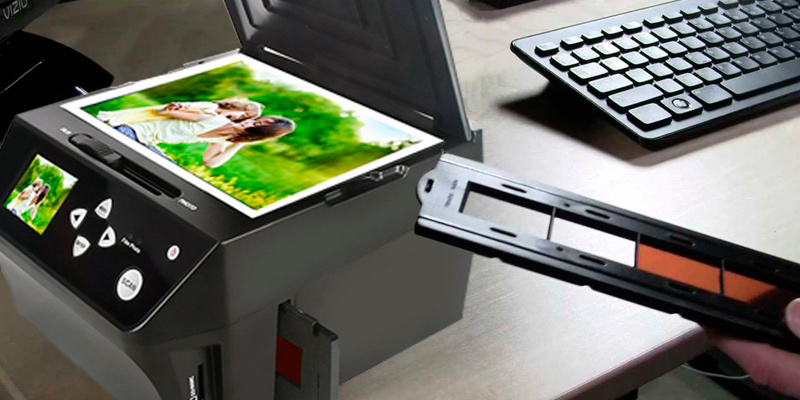 More often than not, for printing standard photos for your photo album, you don’t really need more than 300 or 600 dpi of your slide scanner resolution. The bigger the photo you need to print (for example, an A1 poster with your pet’s mug on it to adorn your living room wall), the bigger resolution it is recommended to set when scanning. The lower resolution offers fewer details but for a small photo, it’s not that crucial, whereas trying to make a large print from a small-resolution photo will result in image blurriness. 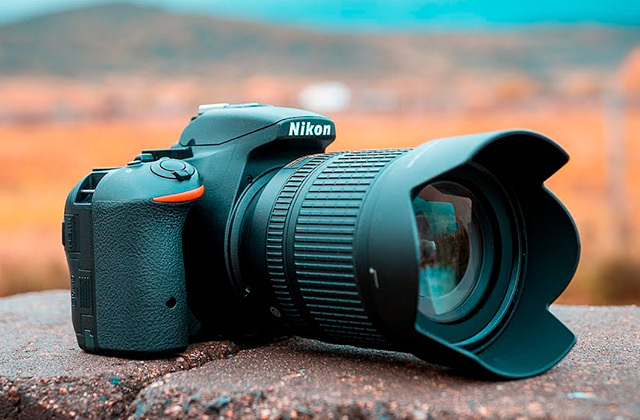 The same goes for editing photos in a special software—if you plan no such thing lower resolution is okay but photo correction is easier when the image is bigger and more detailed. Q: What’s the difference between 24-bit and 48-bit? A: That’s the colour depth you’re talking about, as in, how many bits are dedicated to each of the three main colours (Red, Green, Blue). 24-bit colour depth means 8 bits per colour, and 48-bit is, consequently, 16 bits per colour. What does it mean for your photos? Simply speaking, the more bits are dedicated to the colour, the more shades of the colours the resulting image will have. However, to the naked eye, the 24-bit depth is usually enough, that’s why the manufacturers haven’t stopped making 24-bit slide scanners (and scanners in general). You will be better off with the 48-bit device, though, if you plan extensive editing of your photos or large-scale printing. Q: There are fewer trays in my slide scanner than there are film formats it claims to support. 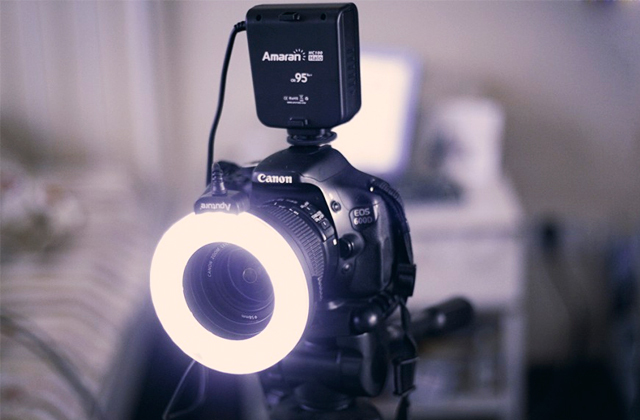 A: Please don’t worry, most often, a single mount can support several film types. For example, you can put 35mm, 110, 126 film all in the same 2" x 2" tray. In some cases, there simply two trays—one for negatives and another for slides, both good for any size of respective films. The main thing is what film your scanner supports but you can also check how many mounts the package is supposed to include, this information should be stated on the official seller page and in the manual. Q: My slides stink, did they go bad? A: Unfortunately, it is possible. If your film is old and was not stored properly, chances are it has accumulated some level of moisture and possibly there are fungi, which do smell rather peculiarly. They can also damage the image on the slides, blurring it, creating spots, etc. At some level, it is possible to restore the image but it will take time and money to do. That is why scanning your film is important. 1. Film Grains Meet Digital Pixels: A Complete Guide to Scanning Film, Photojojo! 2. Craig Thornburrow Choosing A Good Slide Scanner Is As Easy As 1-2-3! (Or Is It? ), Streetdirectory. 3. Rebecca Lily Film vs. Digital, Digital Photography School. 4. Mike Bedford Top tips on scanning old photos, slides and negatives, PC Advisor. December 24, 2012. 5. Tips on Digital Photo Restoration, Cambridge in Colour. 6. Restore Your Old Photos, Pixelmator Team. 7. Rachel Gregg Fix Old Photos With This One Easy Photoshop Trick, CreativeLive. March 31, 2015. 8. Health and safety in the printing industry, HSE.